Russian analysts tell RAI Novosti “Annan’s plan won’t stop war in Syria” and Assad’s ouster is looming in the long term. Whoever thought the Syrian regime subscribed to the Annan plan made a “grave and unjustified” mistake. The international community is fully aware Assad’s regime never fulfilled a pledge. No bank would give it an advance if it applied for a loan. Everyone should have known this. The international community “colluded with Assad” when it set one target date after another for him to continue his massacre of Syrian civilians. “Any attempt to stop the crimes of this regime by diplomatic initiatives such as Annan’s, among others, is a misinterpretation of the nature of the tyrant’s regime in Damascus. 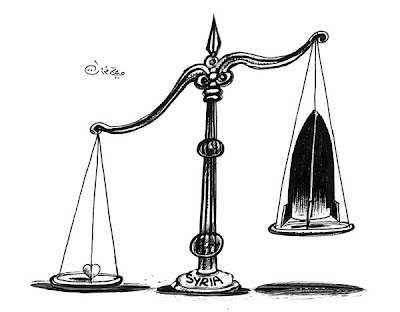 Assad is getting away with all he is doing for the lack of any deterrence against him on the ground. All he hears is empty rhetoric from Turkey and a deafening silence from Obama, who is busy counting” the number of voters supporting his re-election rather than the number of Syrians killed. A triumvirate of three key players – Kofi Annan, the Syrian regime and the Syrian opposition – puts across a thorny landscape where “conditions for mediation are non-existent” and chances of killing fields and disaster scenes are vivid. Paradoxically, each of the sides has strong and weak points at the same time. Annan is strong because the UN mandated him. His weakness is that subsequent support for his mission was expressed “in UN statements for want of Security Council resolutions” for fear of being vetoed by Russia and China. No wonder “tough and bitter maneuvers” are still in store for Syria. Annan’s plan is likely to stall Damascus’ successful crackdown on the opposition but hostilities will not end until Assad is ousted from power, Russian analysts told RIA Novosti. Damascus had to accept Annan’s plan “for form’s sake” because rejecting a UN proposal would have painted it as a hardliner unfit for dialogue, Vladimir Bartenev, a global affairs analyst with Moscow State University, said. “The situation is a mockery of the very idea of conflict settlement,” he added. “The Free Syrian Army will use (a cessation of armed hostilities) to regroup after successful strikes by Assad’s forces in March,” said Bartenev. It is just a formal nod by the global community to international norms of conflict settlement, said Alexei Malashenko, an analyst with Moscow Carnegie Center. “The schizophrenic situation will go on while Assad is scrambling for a way to survive,” Malashenko explained. Both Bartenev and Malashenko said despite Assad’s military success, his ouster is on the cards in the long term. Assad emerged on top in the first phase of the civil war, taking control of the big cities and pushing his opponents to the mountains and countryside where they can resort to guerilla warfare, said Yevgeny Satanovsky, who heads the Moscow-based Middle East Studies Institute think-tank.